Most people try to avoid needing dentures in their later years. Great dental habits, diet, regular dental visits, cleanings and exams are all efforts to prevent needing dentures. Life, as many know, is unpredictable. Life can get busy, bad habits form, dental trauma occurs and aging is inevitable. There are many reasons that lead patients to need dentures, even after a life of immaculate dental care and hygiene. Dentures, however, are not the end of the world. Dentures help you retain your ability to eat, chew and speak properly. They will also help your smile look great. If you hear that you’ll need dentures, you may be thinking of one kind of denture. There are, in fact, multiple types of dentures available. These dentures are the ones that most people picture when they think dentures. Full dentures are the perfect option for dental patients who have lost most or all their teeth, whether it be from decay or trauma. Full dentures have a flesh-colored base that cover the gums with “fake” ceramic or porcelain teeth. The teeth are made to match a natural color and look. The base of full dentures can be either made of acrylic or metal alloy (chrome cobalt). Dentures with an acrylic base fit more securely and comfortably, but they are not as durable as those with chrome cobalt bases. When a dental patient has just a few missing teeth, partial dentures are the best solution. Partial dentures fill in gaps caused by missing teeth by either attaching crowns to existing teeth or with metal clasps attaching to existing teeth. Another version of partial dentures is implant-supported dentures. Instead of clasps and crowns being attached to existing teeth, these partial dentures involve implants being inserted into the patient’s gum to provide a more stable, permanent anchor for the dentures. Conventional dentures typically take 8 weeks to be created and inserted. For full dentures, all the patient’s teeth need to be removed, the gums healed, molds of the mouth taken and the dentures made. During this process, the jawbones can shrink and atrophy. Immediate dentures are premade, which enables the dentist to insert the dentures immediately, preventing the patient’s gums from getting weak and brittle. Some dental patients need full dentures, but have some remaining teeth that are healthy and strong. Instead of extracting perfectly good teeth, dentures will be made to go over the teeth instead. The costs of dentures vary widely. Quality and aesthetics increase with price. With partial dentures, the price will depend on both the quality and how many missing teeth the patient has whose gaps need to be filled. Implant supported dentures provide a more secure fit than traditional partial dentures. 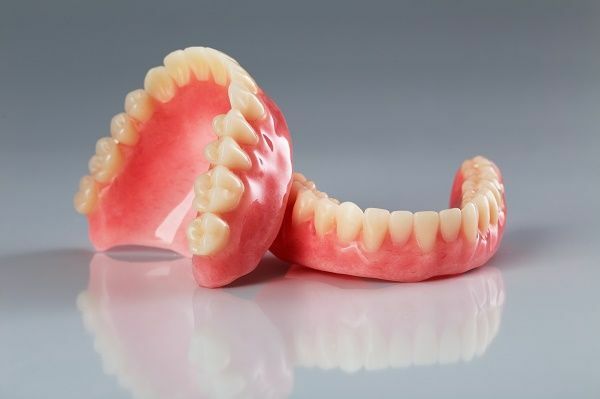 Full dentures with acrylic bases are more comfortable to wear. The more healthy remaining teeth a patient has, the more partial denture options there are available. If a patient has numerous healthy teeth remaining, dentures may not even be the best option, but rather implants. The integrity of the patient’s jaw bones and gums will limit the denture options for that patient. Implant supported dentures, for example can’t be used on dental patients who have compromised or brittle jaw bones. If you need dentures, let us at Grove City Dental help you get the right type for your dental needs and preferences. Contact us today to schedule an appointment.